Mix together the adobo and Worcester sauce and put in a gallon-size plastic bag. Add the chicken and make sure to move the meat around in the bag to make sure the pieces all get some sauce. Put in the fridge and chill for 30 minutes to overnight. Peel and cut the onions in half, then slice thinly. Thinly slice garlic as well. Heat the oil and butter in a large skillet over medium heat. 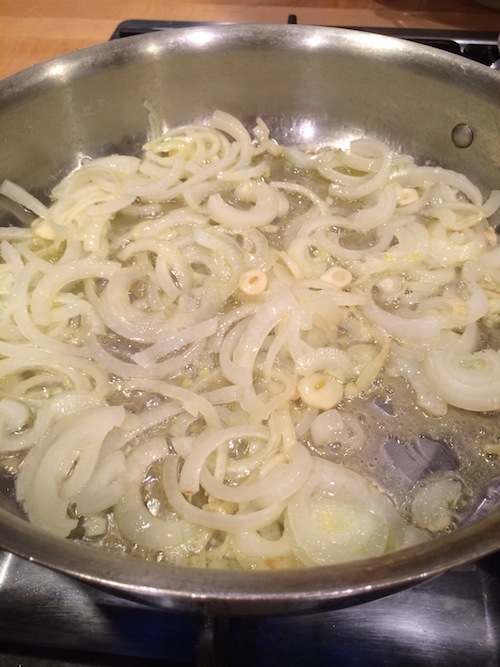 Once the butter has melted, add the onions and garlic and cook until they start to soften and brown. This takes 5-7 minutes.While the onions and garlic cook, remove the chicken from the bag and pat dry with paper towels. Reserve the extra marinade. Add the chicken to the skillet and cook until it is browned on all side, about 10 minutes. 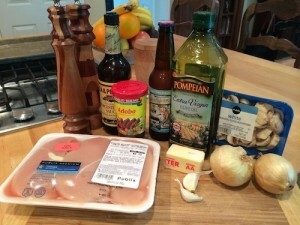 Add the reserved marinating liquid, the beer, and the mushrooms. Bring to simmer and cook until the sauce thickens, about 15 more minutes.Serve over rice or noodles and, if you like avocados, dice and serve with the chicken.